In our work, we encounter a wide variety of people with diverse personalities. The ability to work with different types of people well is an extremely valuable skill. Here are some tips I’ve learned over the years. The most important thing is to sincerely ask God to help you with every project. He knows what both you and your client need and the best way for you to work together. He will give you success whenever you rely on Him. There are practical steps to take after that. When working with someone new, it is beneficial to find out everything you can about their experience, writing style, and personality. Any clues you can gather will help you figure out how to develop a good rapport. Always be respectful. Even if they are a challenge to work with and you’re ranting to your spouse or pet about your frustration, don’t let it leak into your edits or communication. Be professional and kind. As you get to know someone, add funny comments or smiley faces to your edits. Suggest fun ways to remember how to avoid repeated errors. An editor often finds it rewarding to slash and change and rearrange someone’s work—but it’s not fun for the recipient. No one likes to be scolded. Find creative and gentle ways to correct others. You want people to enjoy working with you. We’ve all had to work with a person who is extremely difficult, and nothing we do improves the situation. In that case, know when to cut bait. Finish your contract, forgive them in your heart, then kindly refuse to work with them again. The stress that builds inside of you can leak negativity in every area of your life. You want to enjoy your work and your life. Ask God to provide you with more compatible people to work with. If you are forced to work with a challenging person, the best thing to do is continue to be respectful, professional, and kind. You will maintain your personal integrity, and God will reward you. In life we’ll work with an endless variety of people. 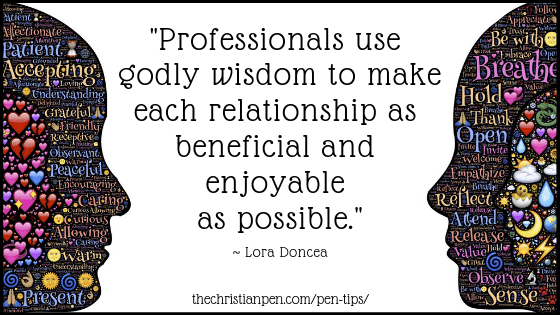 Professionals use godly wisdom to make each relationship as beneficial and enjoyable as possible. Thinking of the people you work with now, what steps can you take to make things even better? 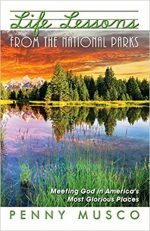 Lora thoroughly enjoys editing fiction and nonfiction books for Christian authors. She views editing as a ministry first, partnering with authors to make their writing polished and successful. She also writes a blog of “Savvy Writer Tips” to help writers spot and fix common problems. 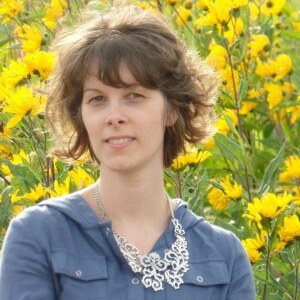 Read them on her website: EditsbyLora.com or on Facebook: SavvyWriterTips. Lora utilizes her varied life experiences to help her when editing. 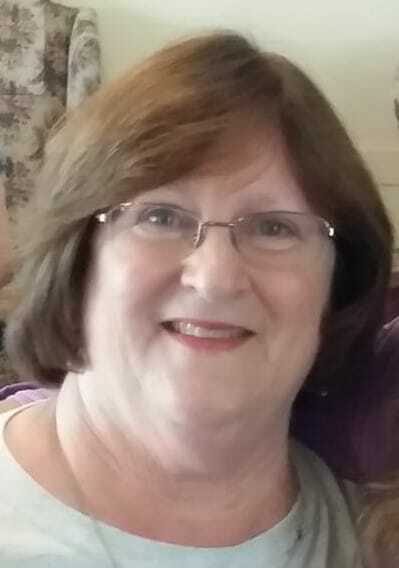 She’s been a recorded Christian musician, a computer and web programmer in the business world, taught college courses on computers, led Bible studies, spent years oil painting and doing photography and videography, traveled, lived in big cities and small mountain communities, and loves to learn and experience new things. 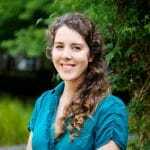 Sarah Barnum is a freelance editor with an eye for both detail and story. 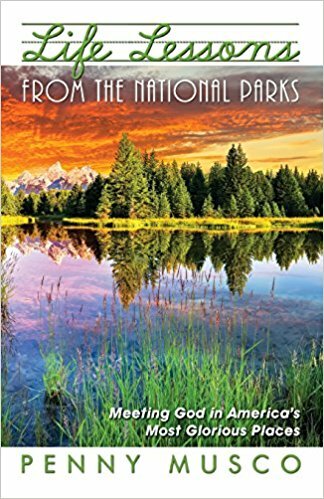 She has been involved with Inspire Christian Writers since 2011 and is a published writer—most recently in Chicken Soup for the Soul. 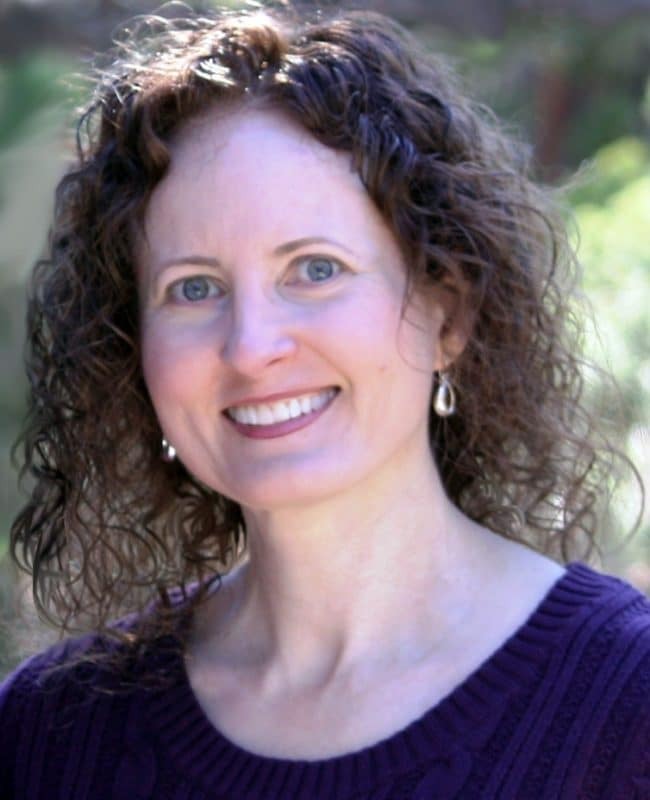 She serves on the board for the West Coast Christian Writers Conference. Sarah enjoys ranch life in Northern California with her graphic designer husband and Appaloosa horse, Ransom. Learn more about TrailBlaze Writing & Editing at www.trail-blazes.com. As an editor, what do you specialize in? I am still developing my specialties and finding the areas that interest me most. Right now I do a little bit of everything—developmental editing, copyediting, and proofreading. My favorite genre to work in is memoir. What are some of your favorite resources when editing or writing? The usuals—The Chicago Manual of Style and Merriam-Webster. Some of my other favorite books include: Big Magic by Elizabeth Gilbert—on the creative process. 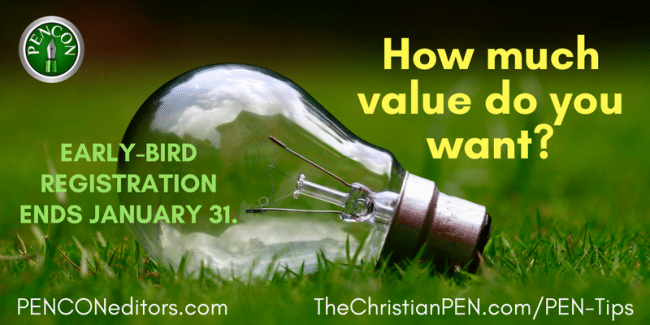 Write His Answer by Marlene Bagnull—a Bible study for writers. Eats, Shoots & Leaves by Lynne Truss—a punctuation comedy. What advice would you give to a beginning editor? First, ask God to make the way for you. When He led me into editing, He made it abundantly clear I wasn’t in control, and I wasn’t creating this career myself. He has opened doors, dropped jobs in my lap, and brought some incredible people alongside me. Second, be teachable and confident. Ask when you don’t know, but also give yourself some credit for what you do know. How has God gifted you to succeed in this business? He made me an introvert and a detail-oriented word nerd, and He gave me a desire to help others. He has also gifted me with people to encourage and equip me. What is your favorite Scripture and why? “You will keep him in perfect peace, whose mind is stayed on You, because he trusts in You” (Isaiah 26:3 NKJV). As a recovering perfectionist and people pleaser, this verse reminds me that focusing on God, not on other people’s opinions or my own failures, is what brings peace. What do you love to edit or read? I read and edit a variety of genres. Some of my favorite authors to read also represent my favorite type of books to read: Jane Austen (British classics), C. S. Lewis (Christian living), and Agatha Christie (mysteries). When editing, I particularly enjoy working on memoir, allegorical stories, and the occasional speculative fiction novel. My special interests include horses, millennials, and Christian counseling. What’s one unique thing about you? I am a certified horseback riding instructor. In my previous life, I managed a non-profit therapeutic riding program for children with special needs. Now I just enjoy riding my Appaloosa horse, Ransom, around the ranch where I live. The best investment is a good investment, but what is a good investment? One that has lasting personal and professional value. As editors, we value the authors and publishers and clients we work with—and we value our editing skills. At PENCON 2018, we guarantee you lasting personal and professional value. Value in friendships. Value in a community that thinks—and speaks—just like you. Value in professional networking. Value in continuing education. Value in stretching your business—and yourself—as you meet new professionals in your field of expertise and learn from their experiences. How much value do you want? Our faculty also represents several Christian publishing houses, including Baker Books, Revell Nonfiction, Kregel Publications, Zondervan, and HarperCollins Christian. And our keynote speaker is Robert Hudson, the author of The Christian Writer’s Manual of Style. You want to sign up! We know you do. Early-bird registration ends January 31, 2018. Get a deal and snap up more than a handful of value by registering early for PENCON 2018. We can’t wait to see you there! Visit us online at www.penconeditors.com. Check out our faculty. Review the sessions. And register now. Like and share our Facebook page, and keep up to date with upcoming sessions and PENCON news. Owner of TM Editorial, Tisha Martin specializes in historical fiction, academic writing, and creative nonfiction. 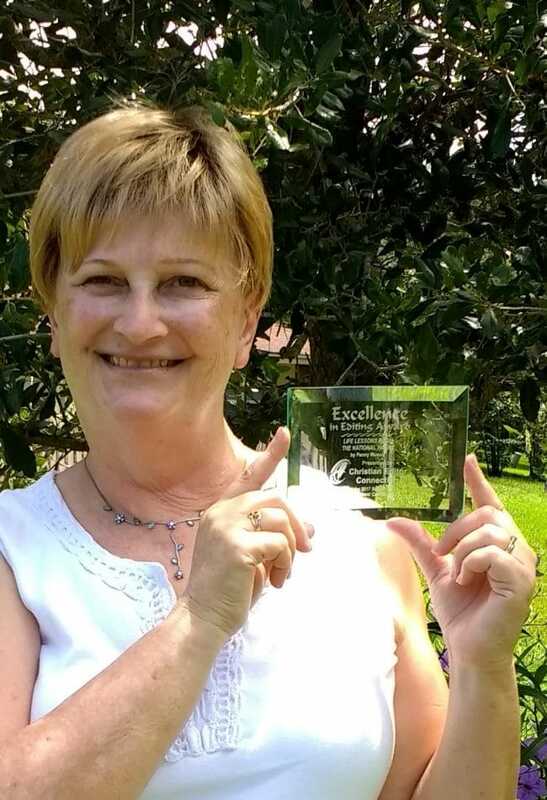 An active member of American Christian Fiction Writers Association and The Christian PEN, she appreciates the writing and editing communities. Tisha is editor and proofreader for beginning and bestselling authors, professional editing agencies, and publishing houses. As Assistant Director of PENCON, she enjoys organizing the conference and creates advertising content for the Facebook and LinkedIn pages. Connect with her on Facebook or follow her Pinterest board for writers and editors.